Film / Video | Patricia DeMarco Ph.D. Featured at The American Conservation Film Festival on October 22, 2015 at 7:40 PM in Shephardstown, WVa. 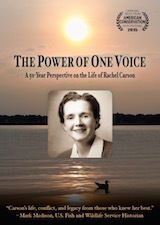 Rachel Carson lived from 1907 to 1964, known as one of the 100 most influential people of the 20th century for challenging the unrestrained poisoning of the earth in her book, Silent Spring. She rose from humble beginnings in the town of Springdale, Pennsylvania to stand for nature. She argued passionately for precaution in applying technologies whose unintended consequences destroy fresh air, clean water, fertile ground and the biodiversity of species that support the living earth. This film collects perspectives from some of the speakers at a celebration of Silent Spring held at Chatham University and The National Aviary on May 11-12, 2012. Carson’s adopted son Roger Christie, her biographer, Linda Lear, and others who followed her footsteps as writers, scientists and advocates, reflect on the example of her life. She stands as a role model and an inspiration to people all over the world, even as the controversy created by her challenge to the chemical industry continues unabated. We see her life and her work in retrospect, and harken to her voice as guidance for our way forward into the challenges of this 21st century. In collaboration with documentary Film Maker Kirsi Jansa, the Sustainability Pioneers series of short videos grew from our discussions about the need to move from just protesting against Marcellus Shale to taking positive action towards sustainable energy practices. This series includes some of the case studies from my book, Pathways to Our Sustainable Future, and some interviews Kirsi did in various cities in Europe where the process is more advanced. Screenings take place with community conversations, see Upcoming Events for current schedule of events. Contact me at demarcop6@gmail.com to request a screening or community discussion and workshop.